Ruth completed a three year professional dance training in performance at choreography at The Place and studied in New York with Merce Cunningham and Murray Louis and Alwin Nikolais. In New York she also trained in Zena Romett’s ballet floor -barre technique and Limon technique. 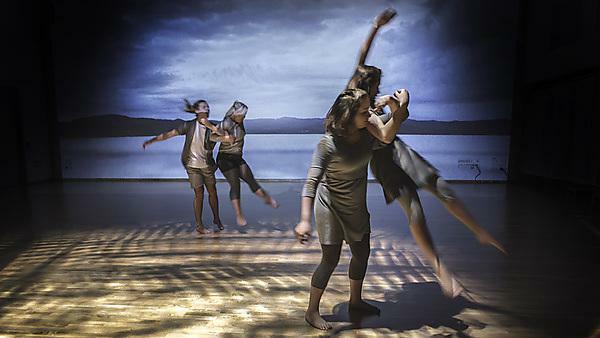 Ruth has taught advanced dance technique at Laban and has performed and choreographed with Earthfall and Lusty Juventus Physical Theatre Company, working with text and movement. Ruth is a certified Somatic Movement Educator and registered with ISMETA. Her research into somatic movement arts informs my teaching approach which places an emphasis on structural movement integration and developing articulate and expressive dancers. Dance Film ‘Blind Torrent’ (2012) featuring Catarina Lau and Ruth Way. Directed and produced by Russell Frampton and Ruth Way. Maryam grew up in Plymouth before studying at the Central School of Ballet. She has performed for choreographers such as Matthew Bourne, Mark Morris and Will Tuckett. Her classical training and performance work inform her teaching. Her classes look at the classical technique in depth with a focus on musicality and individual expression. Heather trained at Northern School of Contemporary Dance, graduating with a First Class Honours degree in July 2014. She's worked with choreographers including Gary Clarke, Charles Linehan, Charlotte Spencer, Corey Baker and Sharon Watson. Since graduating Heather has worked in Fiji with Vou Dance Company for four months, touring around Fiji and New Zealand, before returning to Devon and creating the Heather Walrond Company, and becoming a company dancer for Exim Dance Company and Associate Lecturer at the University. My technical approach comes from a Somatic base, working with principles of embodiment, imagery and whole body awareness to inform our training and technique. In these sessions we will work on using strength and suppleness to allow for a dynamic economy of the body, to hone our technique and prepare us for the contexts of performance and creation. The techniques that we will focus on in these sessions are Release Based Technique and Flying Low and Passing Though, enabling a greater use of the floor, traversing space and a deeper understanding of posture and alignment principles. Charlotte is a dancer, choreographer and filmmaker. She has worked extensively with Henri Oguike Dance Company and Richard Alston Dance Company. Her class is loosely based on the Cunningham Technique with an emphasis on dynamics and flow of movement and an awareness of presentation and performance quality.